A question I see posted a lot on parenting forums is when to start brushing your little one's teeth. The most basic answer is, "when they get teeth" which can vary wildly from kid to kid. My two sprouted teeth fairly early meaning we have been brushing tiny teeth for quite a while now. When Charlie was small, we had a hard time finding toothpaste that he actually enjoyed. Now that he's older and knows how to spit, we can use kid toothpaste with fluoride. Before that, however, it's really important to use a non-flouride toothpaste since "getting their teeth brushed" actually means sucking the paste off the brush and swallowing it immediately. Yum. 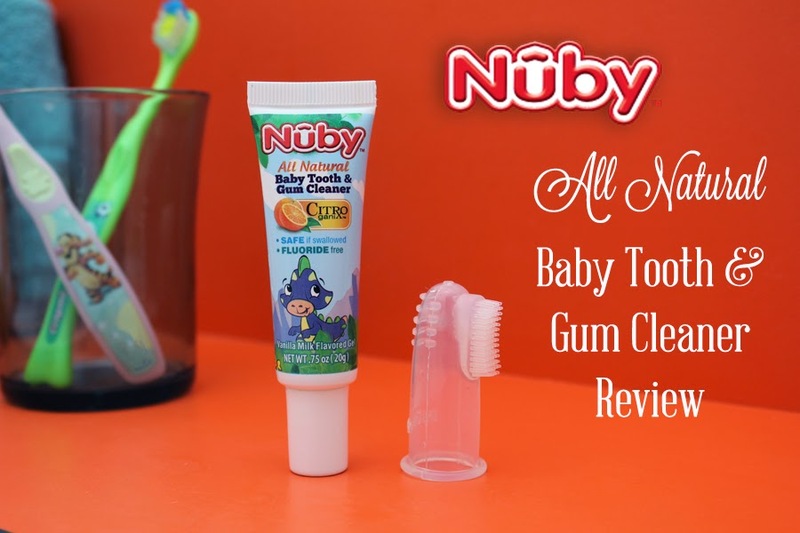 For Ginny, we were fortunate to discover Nuby's All Natural Baby Tooth & Gum Cleaner. This fluoride free, safe, natural toothpaste has been a tremendous hit with Ginny and makes brushing her teeth so much less stressful. Bedtime is hard enough without her hating this necessary step. Oh sweet, time to brush my teeth. This stuff goes on the brush, got it. NO! I was doing it! Heyyyyyy give it to me! Ginny loves her toothpaste so much, she runs right to the bathroom when we say it's time to brush her teeth. She grabs it and her toothbrush out of her cup and tries to start without us. The nice part is that after she gets a turn to "brush," she actually lets us brush her teeth. 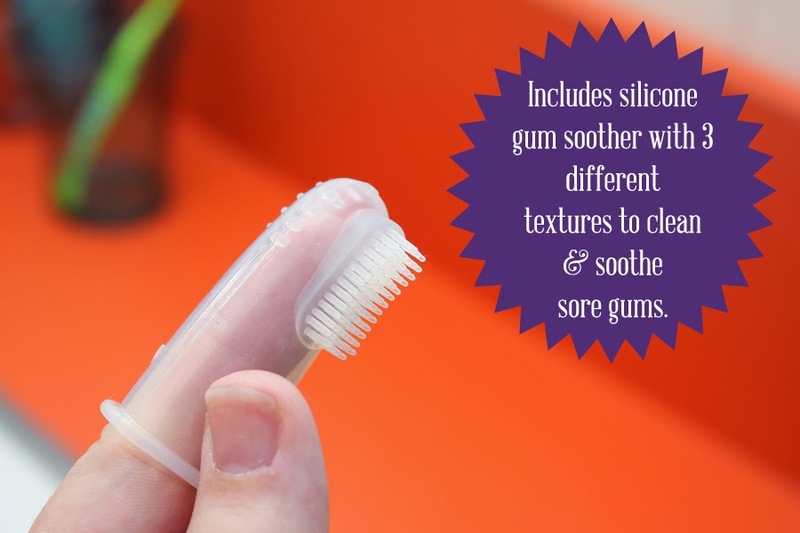 My favorite thing about this product is the soft silicone gum cleaner that comes with it. We don't use it much now that Ginny has most of her teeth, but it was absolutely wonderful for sore teething gums. With three different textures, it is part cleaner, part teether, and definitely appreciated by a grumpy baby. It makes me feel good that I know her teeth and gums are getting clean and that she's not ingesting unnecessary chemicals, colors, or flavors. The Baby Tooth and Gum Cleanser is BPA free, fluoride free, safe to swallow, and endorsed by Pediatric Dentist Dr. Grace Yum - founder of Yummy Dental and Orthodontics for Kids in Chicago, IL. And as with all Nuby things - it's made right here in the USA. Would your little one like to try out this awesome product? You can win it right here! You can pick up the Baby Tooth & Gum Cleanser from Kmart. Check out Nuby's social media sites for coupons and info about their other awesome products! 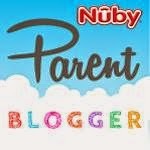 Great review - I love Nuby products :)! Curious how you were able to get the logo on the image like that - PicMonkey? Thanks! Thanks! I use Photoshop to edit all of my pictures. I have a .png vector of the Nuby logo to use on reviews - makes it a lot easier to plop it on pictures!